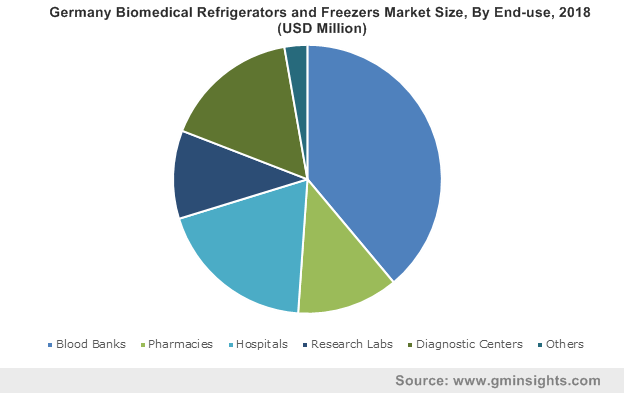 Biomedical Refrigerators and Freezers Market size was valued at USD 2.7 billion in 2018 and is expected to witness 4.2% CAGR from 2019 to 2025. Technological advancements in medical grade freezers and refrigerators will drive the biomedical refrigerators and freezers market growth during the forecast period. Government support for development of innovative products will further accelerate the business growth. For instance, European Commission’s Medical Device Directive has employed certain requirements and regulations for the biomedical freezers and refrigerators to safeguard storage of blood and blood components. Growing demand for biomedical refrigerators amongst the research labs and pharmaceutical companies operating in drug discovery process will foster biomedical refrigerators and freezers market size over the forecast period. Growing prevalence of chronic diseases such as cancer, cardiac diseases and infectious diseases leading to surge in demand for blood transfusion is another key factor that will boost the biomedical refrigerators and freezers industry growth. According to the European Society of Hemapheresis (ESFH), high preference towards plasmapheresis, generally adopted apheresis technique, will raise installation of plasma freezers in hospitals, blood banks and research organizations for storage of fresh frozen plasma, RBCs and other blood components. Moreover, increasing awareness regarding blood donation as well as government initiatives to encourage donation will favor business growth. However, high cost of medical grade refrigerators and freezers as well as growing preference towards refurbished equipment may impede industry growth during the analysis period. Plasma freezers segment accounted for USD 859.8 million in 2018 and is anticipated to have significant growth during the forecast timeframe. According to European Society of Hemapheresis (ESFH), the plasmapheresis is most frequently performed apheresis technique, and hence will raise plasma freezers installation in hospitals, blood banks and research organizations for storage of fresh frozen plasma (FFP). Moreover, increasing prevalence of cancer in developed as well as developing countries will positively influence segmental growth. Shock freezers or blast freezers segment held considerable revenue share in 2018 and is anticipated to witness 4.7% CAGR during the forecast period. Shock freezers rapidly reduce the temperature of biological samples to below -30°C that help in preservation of samples at optimal temperature. Increasing adoption of plasma freezers for fast freezing of blood plasma, pharmaceutical and biological preparations will foster segmental growth over the analysis timeframe. Blood banks segment accounted for more than 38% revenue share in 2018 attributed to increasing number of blood banks in developed and developing economies. Numerous government initiatives for spreading awareness about blood donation has increased the usage of biomedical refrigerators and freezers. Need for reliable blood cold chain for maintaining donated blood, blood storage during donor sessions and transportation of blood samples to laboratory will upsurge segmental growth. Research labs segment is projected to show 4.8% CAGR over the analysis period. Laboratories require freezers and refrigerators along with analyzers and other equipment for operating and meeting regulatory requirements. Most clinical labs use medical-grade refrigeration to ensure the integrity of sensitive samples, blood and blood products, reagents, controls, vaccines and other patient specimens. Increasing demand for reliable and sensitive temperature control mechanisms in research labs to maintain and control uniform temperature will further drive the segmental growth. North America biomedical refrigerators and freezers market dominated the global market with USD 1.2 billion in 2018 and is anticipated to show similar trend over the forthcoming years. High regional growth is attributed to increasing prevalence of chronic and infectious diseases, growing demand for personalized medicines and favorable government initiatives should drive business growth. Moreover, favorable reimbursement policies developed by medical insurance providing companies such as Medicare and Medicaid help to minimize affordability issues faced by geriatric population. Aforementioned factors should flourish the regional revenue growth over the coming years. Asia Pacific biomedical refrigerators and freezers market will witness lucrative CAGR of 5.4% over the forecast period due to rising R&D expenditure, developments in pharmaceutical and biotechnology sectors. Moreover, expansion strategies adopted by leading biomedical refrigerators and freezers market players will further foster industry growth. 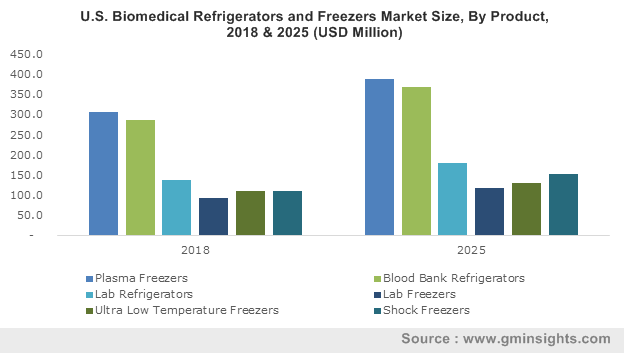 Advances in clinical applications, patient blood management and cellular therapies management have created potential growth opportunities for biomedical refrigerators and freezers market. 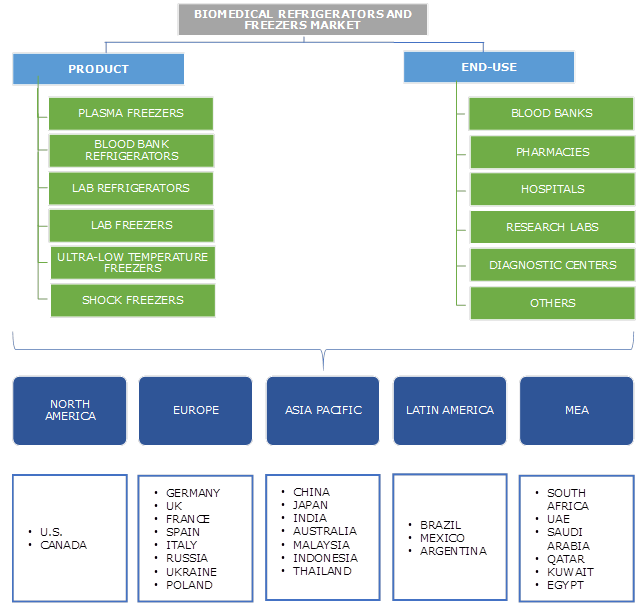 Some of the key industry players operational in the biomedical refrigerators and freezers market include Aegis Scientific, Migali Scientific, Arctiko, Follett, Azbil Corporation, Binder, B Medical Systems, Eppendorf, Helmer Scientific, Liebherr-International, Panasonic Healthcare Corporation of North America, Haier Biomedical, Powers Scientific and Thermo Fisher Scientific. The industry players focus on various strategic alliances such as mergers, acquisitions and new product launch that help them in maintaining their market position. For instance, in February 2017, Follett announced expansion of features offered in all its medical grade refrigerators and freezers used in healthcare industries. The company introduced advanced touch screen user interface for enhanced data management and product protection along with data recording and electronic locking systems. Integration of advanced technology within the biomedical refrigerators and freezers monitors will increase its adoption among the doctors and clinicians that will render company with sustainable profits. International efforts to exterminate smallpox in the 1960s and 1970s required efforts to expand immunization programs as well as develop immunization supply chains. The prerequisite to create a reliable system to ensure cold storage of vaccines during the long journey from the manufacturer to point of use, especially in remote areas, was a critical concern during the early days of the Expanded Program on Immunization. The requirement for apt equipment to transport and store biological products in tropical emerging nations led to innovations and developments in refrigeration equipment. Introduction and widespread adoption of novel and high performance refrigerators and freezers for storage of biological samples such as blood and blood components, tissues and organs has increased in recent years. Moreover, focus of industry players on innovative product development and growing disease burden across the globe will surge the adoption of biomedical refrigerators and freezers thereby augmenting industry growth during the forthcoming years.